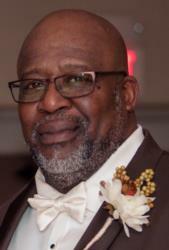 Mr. Rodney Parham, 64, of Radcliff, KY died on July 18, 2018 at Hardin Memorial Hospital in Elizabethtown, KY.
Mr. Parham was a native of Petersburg, VA and the son of the late Hazel (Sr.) and Delores Parham. He was a member of Canaan Christian Church and was retired from the U. S. Army. Survivors include his wife, Jonetta Wheat Parham of Radcliff, KY; two sons, Isaiah Jay Anthony (Mashanda) of Indiana and Hashim Madyun of Elizabethtown, KY; one daughter, Gizelle Parham of Virginia; one brother, Stanley Parham of Richmond, VA; four sisters, Vanessa Prosise (Herbert) of McKinney, VA, Sandra Coleman of Virwinie County, VA, Marilyn Parham of Radcliff, KY and Veronica Parham-Archer of Dinwiddie County, VA and two grandchildren. Funeral service will be held at 1:00 pm on Thursday, July 26, 2018 at Percell & Sons Funeral Home with Pastor Roland Butler officiating. Burial will follow at Kentucky Veterans Cemetery Central in Radcliff with military honors. Visitation will be from 6:00 - 8:00 pm on Wednesday, July 25, 2018 at Percell & Sons Funeral Home. I am so sorry for your loss Jonetta. I will always be here if you need anything. Prayers to you and the family, love! Jonetta, Margaret and I are truly sorry for your loss. There is nothing we can say that will ease the pain in your heart except be there for you if needed. The US Army Recruiting Command was blessed to have had him at the Watch Officers desk. I feel blessed to of known him and woked with him. It doesn't seem the same passing by the desk without seeing his smiling face. I know you will be comforted by friends and family over the next several weeks and will be in good hands. You will remain in our prayers.